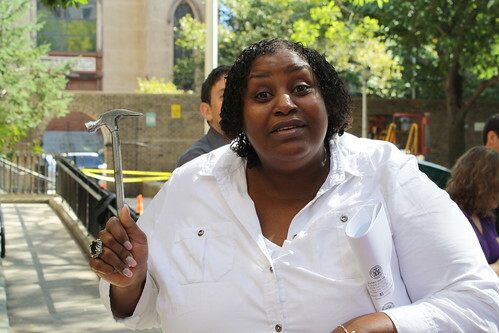 Dana Varinsky Dereese Huff with a hammer she carries for protection. Elected officials blasted the New York City Housing Authority this afternoon for not being quick enough to make security upgrades, citing a recent study that indicates many public housing residents don’t feel safe in their own homes. Meanwhile, the authority pointed the finger right back at local politicians. 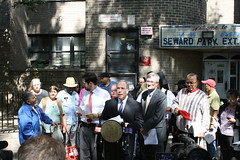 In July and August, the offices of Borough President Scott M. Stringer, State Senator Daniel Squadron and Assemblyman Brian Kavanagh polled 520 residents at ten public housing developments, including Campos I, Jacob Riis Houses I and II, and the Lilian Wald Houses in the East Village, as well as seven others on the Lower East Side. According to the report, which can be read below, more than 40 percent of survey respondents said they felt unsafe in staircases; only 45 percent indicated they have lobby doors with working locks; only 49 percent said their building had a working intercom; and 65 percent said not enough is done to prevent trespassing. Touching on an ongoing point of contention, nearly 80 percent of respondents who did not have security cameras in their building said they would feel safer if they were added. In March, Dereese Huff, president of the Campos Plaza Tenant Association, complained that the Housing Authority had yet to outfit the complex’s buildings with $400,000 in surveillance equipment, financed by Councilwoman Rosie Mendez. 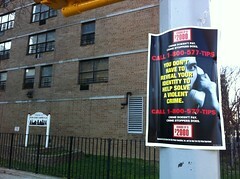 Months earlier, her friend’s son, Donovan “Keith” Salgado, had been shot to death at the complex. Last month, Councilwoman Rosie Mendez said during a press conference that the cameras would begin to be installed at Campos this fall. Ms. Mendez told The Lo-Down that cameras had already been installed at Jacob Riis Houses, but more funding is needed for the Baruch Houses. A resident of a Bronx housing development told New York magazine last month that he was so fed up with the lack of cameras that he installed some of his own. The Authority said in a statement that since the beginning of this year, it has had “a comprehensive strategy in place” that includes more cameras, wireless key cards, and “modern” intercom systems. A representative for Mr. Squadron said the state senator had allocated $750,000 dollars for security cameras in his district, but that the funds has been blocked for nearly two years by the state senate’s Republican majority. Mr. Kavanagh went on to complain, as did the report, that due to agreement made in 1995, the Housing Authority pays the Police Department in excess of $70 million a year as compensation for “above baseline” services, and yet Housing Bureau officers are often diverted to other causes such as Occupy Wall Street. It goes on to recommend that the city renegotiate the arrangement by which the authority uses its Housing and Urban Development subsidy to reimburse policing. Almost half of the survey respondents said the police presence in their buildings is not adequate. The survey comes on the heels of a recent Daily News report that the Housing Authority has spent only about a fifth of the $1.2 billion it has received, from 2009 through this year, to modernize its developments. This post was revised to include comment from State Assemblyman Brian Kavanagh, who was misidentified as Patrick in the original version. That error has been corrected.